Join CryptoChicks for our“3 Day Blockchain & AI Hackathon” & Win up to 150,000 PKR! CryptoChicks Pakistan is organizing a “3 Day Blockchain & AI Hackathon” on 12th to 14th April 2019 at 10 Pearls and The Nest I/O. This hackathon is for everyone who has expertise and or interest in these emerging technologies and understands the potential use for them in the real world. We look forward to welcoming students, software developers, UI/UX designers, business analysts, technologists, community leaders, educationists, advisors, mentors, entrepreneurs, crypto-curious individuals, thought leaders, and investors. Our hackathon encourages individuals and teams from diverse backgrounds and experiences to work on finding technological solutions for both local and global problems. The winner of the CryptoChicks Pakistan Hackathon will get cash prize up to 150,000 PKR! This hackathon is a great opportunity to learn and get mentorship with industry professionals. Participants will develop a Blockchain and AI-based application to solve real-world problems and get free access to blockchain courses and global community. It is the first ever Blockchain and AI hackathon in Pakistan organized by CryptoChicks Pakistan in partnership with ConsulNet Corporation and WomenInTechPK and Happening.pk is the official ticketing partner. 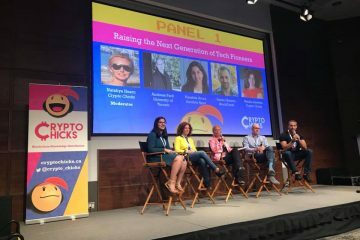 CryptoChicks is a non-profit organization with a mission to educate women and youth in blockchain and AI technologies through education, mentorship, business, and diverse employment opportunities. Register now and compete to win up to 150,000 PKR!